came the text. He was, of course, referring to the crayfish party that I managed to snap out of my antisocial funk long enough to attend. 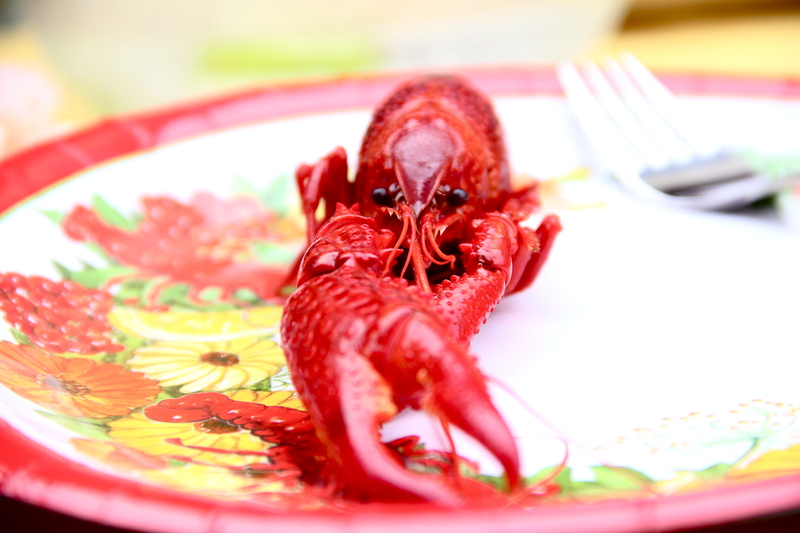 Crayfish parties are a very Swedish celebration of life/the end of summer/alcohol. They involve games, drinking, and decorations resembling Chinese new year’s lights. Oh, and crayfish. Which are like lobsters in their color, shape, and beady angry boiled alive eyes; but unlike lobsters in their size and willingness to provide accessible meat. Due to my rather temperate drinking, I possibly missed the entire point of a crayfish party (getting plastered), but I still had a good time. Here is a photo I took of my first little buddy. I refrained from naming him because…well you know. So…the last time I saw a crayfish up close and personal was at a Chinese buffet. It reminded me of a large cockroach. I just couldn’t get past the antennae, and suddenly, I actually thought I might throw up right on the Chinese waiter who was coming by to re-fill our water glasses. I made Amy cover up the crayfish (of course it was on HER plate, all ready for brain-sucking), and she couldn’t get the napkin to stay over the antennae. Gag. Gag. Gag. But, somehow, your picture is cute. Sebastian.